Prince Hall was one of Boston's most prominent citizens during the revolutionary period. It is believed that he was one of the six black Prince Halls of Massachusetts listed in military records of the Revolution, and he may well have fought at Bunker Hill. Tax records for the period show that Hall was a leather dresser who owned a leather workshop. 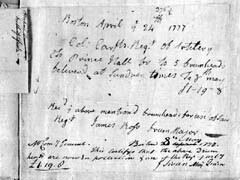 In April, 1777, Hall submitted a bill to a Colonel Craft of the Patriot forces. It survives today, and indicates that he crafted five leather drumheads for the Boston Regiment of Artillery.